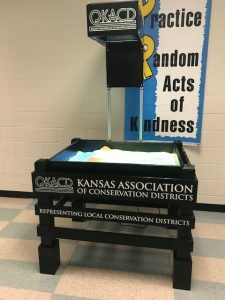 Through an agreement with the USDA Natural Resources Conservation Service, the Kansas Association of Conservation Districts has obtained two Augmented Reality (AR) Sandboxes for use across the state at schools and events. With the AR Sandbox, you can create different geographic formations, from mountains to valleys and floodplains. The exhibit is hands-on and interactive. 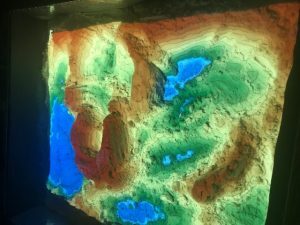 The AR Sandbox can be used to teach about topography, geomorphology, hydrology, erosion, and deposition. Viewers gain a general understanding and awareness of the watershed in which they live and how water moves within the watershed. If you would like to have the AR Sandbox at your educational event or school, contact your local conservation district office.